"I know that smart aleck Tex," said the first. "He's going to start bragging about that new foreign car he bought as soon as he gets back." "Not Tex," the second cowboy replied. "He'll always be just a good ol' boy. When he walks in, I'm sure all he'll say is hello." "I know Tex better than either of you," said the third. "He's so smart, he'll figure out a way to do both. Here he comes now." 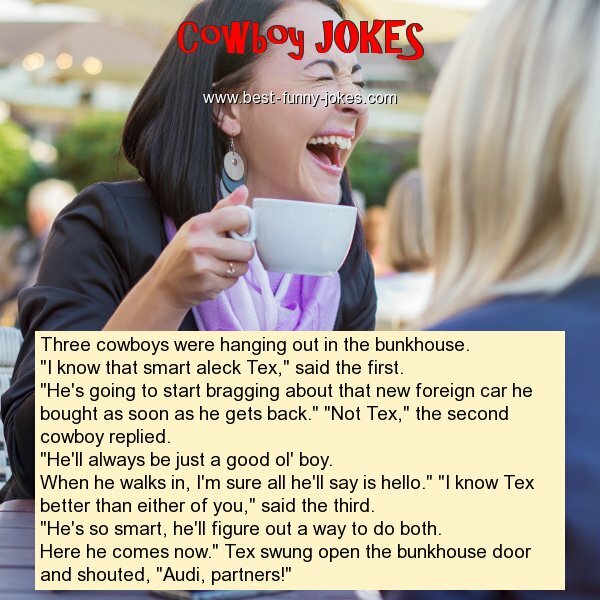 Tex swung open the bunkhouse door and shouted, "Audi, partners!"